My summer days have been filled with weeding, cleaning, and a walking dogs at Wayside Waifs with my son Andy for fun. Summer seems to be zooming by at record speed! My weeding seems to be focused on our vegetable garden in the back acreage. I can hardly wait for our first tomato. In the evenings, I'm stitching. This piece has been relaxing and fun for me. I try to complete a letter or two....or if I'm really ambitious, I stitch an entire line. The flower/strawberry border really makes this piece sweet. 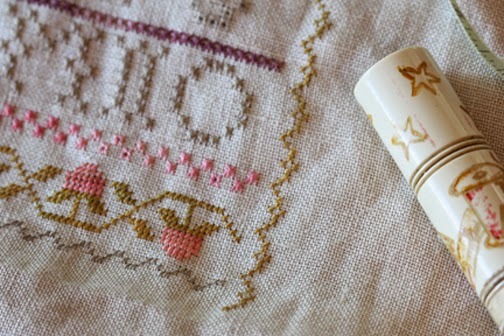 During a cleaning and sorting frenzy I found this sweet needle minder attached to a piece of linen in my studio. It had been forgotten and now it's back to work, holding my needle in place. I love this sewing aid. Wish I could remember where it's from. Above is the most recent Loose Feather pattern. It should be at your local cross stitch shop now. Hope you are all having a wonderful summer. Have a happy 4th of July! Have a blessed Independence Day too! We are a blessed nation. I LOVE your needle-minder, and the new pattern is simply gorgeous! I will have to finally make that trip to a cross stitch store. You see I'm a quilter, and only go to quilt shops. One day while in my favorite quilt shop, I asked about cross stitching, and they told me of a store. So I will have to venture over there soon! I love my needle minder too! I got mine at Jinny Beyer's website. I bought extras to give to my sister and BFF! She has several types for sale online. Very nice! I've finished stitching my sampler, but haven't decided how I'm going to frame/mount/???? 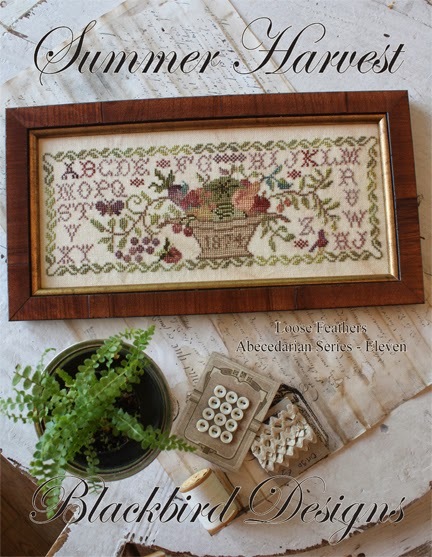 I have this sweet sampler kitted up anxiously waiting to begin it..... It looks link it's been a very relaxing stitch for you~ the needle minder is beautiful! It looks like a treasure.... If you end up remembering who it's by, would you please post??? I don't use them a lot, but I'm definitely drawn to this one.... It's perfect!! Such lovely stitching...I've started the sampler myself but haven't gotten very far. The four-sided stitch seems to take me forever! Adore your blog and your designs! 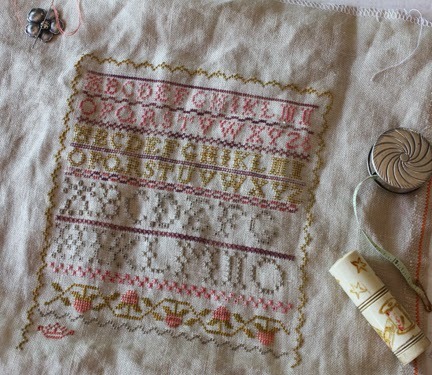 Lovely stitches and design. Summer should be lazy and easy although I'm making pickles and birthday presents and I need to mow...again. LOL! It's not been lazy or easy around here! It does make me appreciate my stitching though when I finally sit down at the end of a full day. Lovely needle minder too. Happy 4th to you too. That's my favorite pass time to stitch as my evening comes to a close. Beautiful stitchin' and a wonderful new pattern I might add!!! Happy Blessed 4th to You! Hoping your 4th of July was as wonderful as your new design was again another winner! Découvert sur le blog du marquoir d'Elise, j'aime beaucoup votre petit sampler ancien. Est-il possible d'en avoir la grille ? D'avance merci et "have a nice day"
Hello Martine, si tu n'as toujours pas trouvé cette magnifique grille, regarde en page 2 de ce blog et tu verras qu'Alma a mis le lien "Here"
Thank you for this stich along. I was so glad to pretend my 3G grandmother stitched this at the age of 11. I am aware of no samplers in existence for my family, so this is it. I do not have a working blog or Instagram, but as soon as your E-mail address pops up I'll send it. Hi Alma, your progress is so beautiful. Thanks for this sampler that i enjoyed a lot. 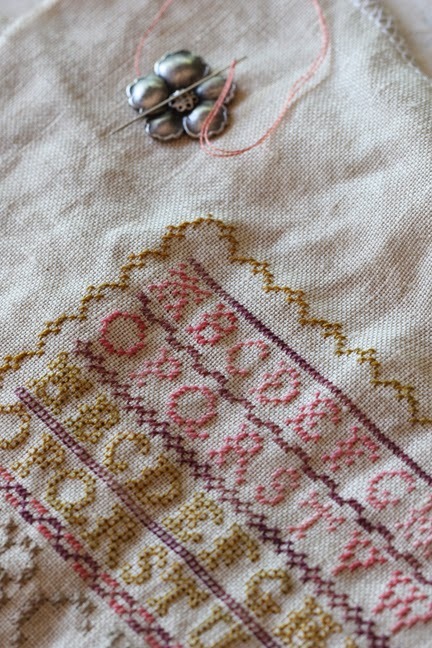 I'm very exited to see the last abecedarian series sampler that i'm embrodering. I have one question, Summer Harvest is the 11 th on a serie of 12 LF, can you tell me please if there is a 12 th LF and when ?? This page is insightful and helpful. Lots of people will assert that everything in your site is great. :) you can also visit Web Design Nagpur for the same. Thank you for sharing information that can be useful to the reader. Untuk lebih lanjut kunjungi di blogger //vinnazolam.blogspot.co.id/ atau INVITE aja pin BB kami GAN 2A065E1B. Dijamin ok dan memuaskan.no tipu-tipu GAN. Bagi AGAN-AGAN yang membutuhkan OBAT PENENANG , Kami persilahkan untuk invite pin BB Operator kami 2A065E1B atau 28D4006F. Dijamin OK sampai tujuan dengan rasa aman dan nyaman GAN. Privasi AGAN kami jaga dengan sebaik-baiknya. Atas kepercayaan AGAN , satu kehormatan buat kami dan kami ucapkan banyak trimakasih. Maaf ya Gan numpang lewat. Yang mempunyai kebutuhan obat PENENANG atau DEPRESI, Kami menjual obat tersebut Gan dengan harga bersahabat. Untuk lebih lanjut silahkan invite pin BB 2840C94F operator kami Gan. Dijamin kualitasnya OK dan sampai tujuan pengirimannya. Atas kepercayaan AGAN terhadap kami saya ucapkan banyak trimakasih.